When it comes to the record industry, Cherry Hill’s Steve “Mr. Mig” Migliore just might be the biggest name you’ve never heard. Steve Migliore's fingerprints are all over the recording industry. Better known as “Mr. Mig,” this highly decorated producer and songwriter has countless credits to his name, including early work with rising stars. 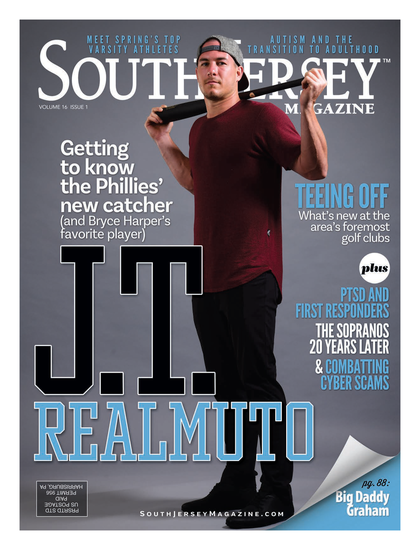 Just ask South Jersey cover girl Taylor Swift: he produced her demo tapes. He’s remixed songs for Usher and Beyoncé and coached Carlos Ruiz through radio commercials. Despite all that success, he still shows up for work every day. In Cherry Hill. That’s where you’ll find Migliore working seemingly round the clock in the cozy confines of his Audiomaxx Studios. Day and night, Migliore is busy arranging, remixing and writing. His music has turned up in movie trailers, and in TV commercials for everything from Tide to Reebok. His name has appear­ed on billboards in Times Square and the Las Vegas Strip. The Cherry Hill West grad’s hard work also contributes a higher purpose: putting South Jersey on the map as a music-making destination. “People in the business say, ‘Oh man, if you lived in New York.…’ If I lived in New York, I’d be a studio producer like the guys on the next block. I am in an area where I don’t think anybody does what I do,” Migliore says. Looking back on the past, the future, it seems, was never really in doubt for Migliore. “I knew from the time I was about 7 years old that I was going to do this for the rest of my life,” he says. As a youth, Migliore was taken by the synthesizer-heavy music his older brother’s band performed. Intrigued, he began playing the family’s electric organ trying to mimic his favorite songs on the radio. By age 9, he was singing too. It wasn’t long before he was performing for and with the family, jamming alongside his brother and his bandmates. By the time he was in high school, Migliore’s every free moment was consumed by music. “It became a way of life for me, I had to have music to be me,” he says. Nevertheless, after receiving his diploma, he headed off to Temple University. His stay on campus would be short lived. While he should have been studying, he was in his dorm room making music. After another brief stint at Camden County College, Migliore informed his parents that he was quitting school and pursuing his dream. The news didn’t go over well. Migliore took on various jobs to get by while he honed his craft. But balancing a full-time job and a full-time passion proved difficult, and there were days when Migliore wondered if committing to a desk job would have been the better move. He began working with a manager and promoter in hopes of getting his name in the spotlight, but after a couple of years pounding the pavement, he still hadn’t broken through. “I considered [giving up], but at the same time, when I turned on the TV, I see these people doing what they want to do. What makes them different from me? I really didn’t know what the answer was, but in my heart, I am just as good as anyone else,” he says. Self taught and self made, Migliore pushed harder, and began to focus on production and doing some remixing work. His first big break came when he got the chance to remix a record for Joey Lawrence, a Philadelphia native then best known for his role on the sitcom Blossom. At the time, Migliore was working in a food court, so getting his first major label credit—and, more importantly, first major label paycheck—was exciting recognition. But not as exciting as what would come next. A 13-year-old country singer by the name of LeAnn Rimes had a smash hit climbing up the charts, but outside of country radio the song didn’t get any airplay. Migliore was approached to turn the country ballad into a dance record for mainstream pop radio. The original version of “How Do I Live” peaked at No. 2 on the charts. Migliore’s version went to No. 1. All of a sudden, the struggling 24-year-old had his first hit record. Today, the single is certified three-times platinum. “It was great to look at Billboard Magazine and see something written about you, and see the song on the charts,” says Migliore. “That was the springboard.” With all the excitement, though, came some uncertainty. “Does this mean I have a career? I didn’t understand how it worked,” he recalls. Within weeks he was flooded with phone calls, making nearly 40 records in a calendar year. Earlier this year, Migliore joined forces with fellow producer and DJ Mike Rizzo to form their own production company, Global Groove Productions, using his Cherry Hill studio, where he works alongside his wife Diana, as home base. With Migliore’s and Rizzo’s connections and reputations at work, they are attracting a bevy of artists eager for the producers’ Midas touch. On the rare occasion that Migliore is not toiling in the studio, he’s speaking at local colleges or giving YouTube tutorials on technique for aspiring producers.